Your sponsorship is more than just an ad. 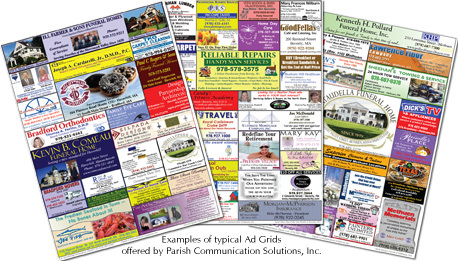 Not only will your bulletin sponsorship provide a great advertising benefit for your business, but it will help provide important support for your local parish and the important services they provide throughout your community. That’s because a substantial portion of sponsor revenues goes directly to the parish in various forms of assistance. Meanwhile, our state-of-the-art digital presses enable limitless color choices for your ad. Plus our experienced design department will gladly assist you, at no charge, in creating a custom ad that effectively communicates your business’ message. Download our full-color brochure including ad samples and sizes & rates. Now everyone wins! With vibrant colors and flexibility at your fingertips, you now have a cost-effective way to reach a large audience.